My garage door slowly opens and I carefully back my car into the alley avoiding my trash cans. Making a last minute trip to Trader Joe’s for a couple items before some of my girlfriends arrive for lunch and a beach day, I always manage to forget something. I smile, so fortunate to hang with friends on this beautiful southern California day. I’m looking forward to chatting and laughing and eating and drinking. I like to bank this time, the warmth and love, and then use it to fight off loneliness on the days or evenings when I am on my own. My thoughts somehow take me to him . . . a handsome man, an old friend that I dated several years ago. We didn’t date long; looking back the only things we had in common were some high school friends, four unsuccessful marriages between us, and loneliness. We were so honest and articulate when we talked about loneliness, the achiness of wanting someone in your bed, a hand to hold, a voice to listen. I let my thoughts drift and I find myself at a stop light with no memory of how I got there. Autopilot I guess. As I wait at the light, I twist and stretch my neck; side to side it cracks and pops. I feel a presence, someone looking at me. I glance over my shoulder at the car beside me. The windows are tinted, it’s dark, but I can see it’s him. He immediately smiles, a rugged handsome smile. We roll down our windows. I smile too. He says I know you. I laugh and ask him how he is. He takes a second to respond and then looks ahead. He manages a not so convincing, okay. I want to say, just okay? And maybe I did. I quickly play through my head, Oh my God; I swear I was just thinking of you five minutes ago! Crazy! I decide it’s best left unsaid. Even I can’t believe what just happened. I tell him life is good and busy. The light changes and he winks and tells me the house looks great, must have seen the pictures on Facebook or maybe driven by. I wish him well and zip away, looking in my rear view mirror, he disappears from sight. Funny coincidence or a message from the Universe, I’m not sure. In that moment, I am bothered that loneliness continues to creep up on me, a hyper focus and common theme in my life, a consistent emotion. Too often I have let loneliness guide my actions, resulting in an even greater loneliness. My therapist once told me that that I needed to accept the possibility that I might spend the rest of my life without a partner, and I should get comfortable with that idea. Her words totally pissed me off at the time, but now I see that accepting it potentially frees me from making decisions based solely on the fear of being alone. So on what basis do I make decisions now . . . my needs, my wants, and my heart’s desire. Now that is risky business. That means I have to be vulnerable. I HATE being vulnerable. I know without a doubt it is the only way to connect deeply with other human beings, the only way to belong in the human race, but I still hate it. I have been vulnerable. I put all my eggs in one basket and gave it my very best shot. I have never been so brave. It was the wrong person at the wrong time and so unbelievably painful. I am sure one day I will see the beauty in that experience, I’ll recognize that it led me to something even better. But for now it’s just too close, my heart still aches and loneliness lingers. I remind myself that I have been fearless, strong and independent in so many ways, my education, my professional goals, my writing, but where relationships are concerned; I have not been able to balance my strength with vulnerability. I know I have it me, I do . . . it’s just not today. So, for now, I will enjoy this beautiful day, show gratitude for my loving, caring friends and family, appreciate the memory of that handsome smile, and continue to work up the courage to be vulnerable. I think it’s a really common problem to struggle with being vulnerable. You can’t really build anything meaningful without it, but it’s always a risk to let the walls down. Did it take your breath for just a second? Its strong I think, just looking for the space the breathe again my buddy. Ooh! I love that sorta synchronicity! This is the best thing I’ve read all day. With any luck, something I don’t like to count on, he will read your blog and maybe respond. Perhaps, he like so many of us that have been down that path of failed relationships, he too is concerned about being vulnerable. One of you should be willing to take that next step, when your ready. I don’t believe in coincidence, it happened for a reason. Beautiful writing. Thank you letting me into your moments. That’s because it’s always so interesting. PS– I think you have moments of vulnerability all the time. I see them. You just don’t pull the curtain very often. I think that’s smart. And you’re right… Mr. Marlboro Man was supposed to come along and say that to you exactly at that moment, at the very least so that you could write about it and inspire us. 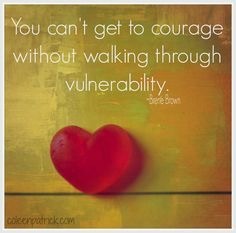 Vulnerability seems to be a theme lately across many blogs I’ve read, and it seems we all battle with it across many areas of our lives. I enjoyed reading this, and it is so relatable. Thank you for sharing! As a side note, I’m just wondering what part of So. Cal you’re in. I’m in the south bay area. Forgot to mention I live in Huntington Beach :-). I’m in Redondo Beach! Small world! I’m in Redondo Beach! What a small world!